← Wie mache ich einen ukrainischen Atomunfall? Over the last 24 hours, we received reports of approximately 40 instances of shelling by Russian-terrorist troops. The enemy was the most active in the Donetstk, Luhansk, and Debaltseve directions. Units of Russian-terrorist troops that took part in the assault on the Donetsk Airport have been withdrawn further inside the battle lines to restore their combat capacity. As a result of negotiations between Ukrainian military servicemen on one side, and terrorist and Russian troops on the other side, an agreement on mutual evacuation of the dead and wounded has been reached. However, to the north of this area, artillery shelling continues. One of the terrorists who died in battles for the Donetsk Airport on 12.01.2014 was identified as the Acting Head of Staff of one of the Russian Armed Forces special operations brigades. This Russian officer died of a shell fragment wound. In Donetsk, he was in charge of the tactical control operations team that acted as a direct part of Russian-terrorist troops combat formations. The body of the deceased was evacuated during the declared ceasefire, and prepared to be transported to Russia. We received confirmation of information previously received by the IR group, about a recent death of 3 employees of the FSS (Federal Security Service of Russia) in Donetsk. The deceased were communications specialists. The minibus transporting the FSS employees encountered an ambush in the Kuibyshev District of Donetsk, and came under small arms fire. The unidentified assailants fled the scene. 7.62 and 5.45 caliber bullet shells were found at the incident scene. Additionally, there were several 9 mm caliber shot holes in the body of the minibus. It is most likely that only one of the three Russians had the time to react to the attack, firing several shots from an automatic weapon through the vehicle window before he was killed. Transport vehicles (at least 25, predominantly covered KAMAZ trucks) carrying artillery ammunition were seen headed to an area to the north of Donetsk, traveling through Makiivka. During the last 6 days, insurgent artillery groups have been shelling the positions of Ukrainian troops on the Pisky – Donetsk Airport – Opytne – Avdiivka line, and made several strikes on commercial and residential areas of Avdiivka. According to the data of the IR group, current “humanitarian convoys” from Russia are meant to replenish the ammunition stocks, which were considerably depleted as a result of this shelling. Yesterday, a convoy of armored vehicles (up to 20 units) passed through Luhansk. 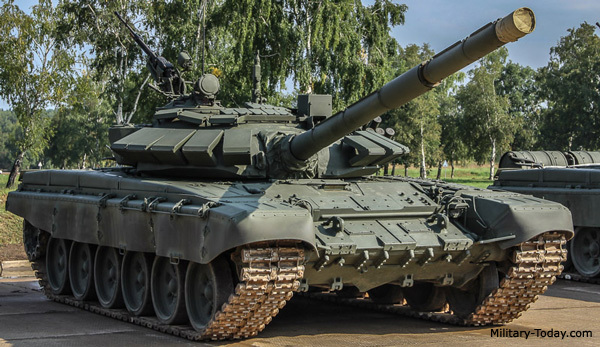 The convoy included 6 tanks, including Russian T-72B3. Pro-Ukrainian forces have become more active in several Donbas towns at once. In Torez, pro-Ukrainian graffiti along the lines of “Donbas is Ukraine!” is appearing every night, in prominent locations. A similar situation is observed in Horlivka, where unflattering descriptions of the Russian President Vladimir Putin are regularly appearing on house walls. Both these towns are under rigorous control by the insurgents, who enforce a curfew there. Under its rules, insurgent “patrols” can fire without a warning on anyone found outside at night time. This entry was posted in Dmitry Tymchuk, English, English News, War in Donbas and tagged #RussiaInvadedUkraine, #UkraineUnderAttack, Dmitry Tymchuk, Information Resistance, Ukraine. Bookmark the permalink.